by the Center for Rural Policy and Development showed that 26 percent of child care needs were not being met in the region. It’s a move in the right direction, still, every day, parents struggle to find child care—impacting local employers as much as families. What is WCI doing about it? “Uniting ideas and resources,” as WCI’s vision states, to help communities, employers, nonprofits and providers meet the need. 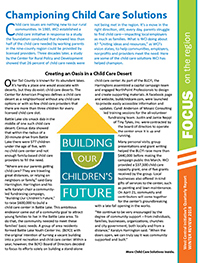 In the current issue of our newsletter, Focus on the Region, we shine a light on some of the creative child care solutions WCI has helped champion. Download our latest issue of Focus on the Region. View our online child care resources.